The Miami Hurricanes are two weeks away from kicking off the 2017 season with its opener against Bethune-Cookman at Hard Rock Stadium, and Mark Richt has not yet settled on a starting quarterback. With the departure of Miami’s all-time passing leader Brad Kaaya, the Canes have tried to fill the hole under center. Redshirt junior Malik Rosier, redshirt sophomore Evan Shirreffs, and true freshmen N’Kosi Perry and Cade Weldon have been auditioning for the job throughout fall camp. However, it seems like the race has narrowed, with Rosier and Shirreffs splitting reps with the first-team offense during drills and the team’s second scrimmage Saturday. Although many expected Richt to announce Miami’s next starting quarterback after the scrimmage, the second-year head coach still has more thinking to do. 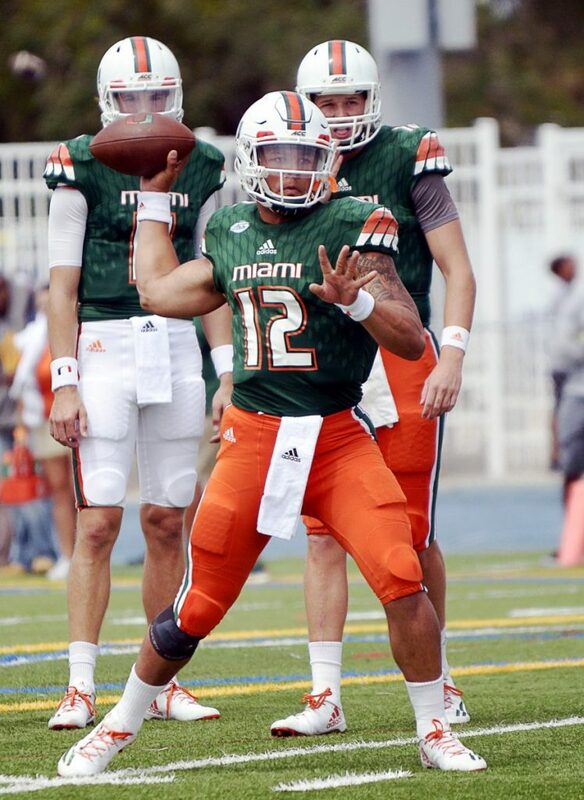 Rosier, who has made one career start back in 2015, completed 17 of 25 passes for 260 yards, two touchdowns and one interception in Saturday’s contest at Greentree Practice Fields. Shirreffs completed 13 of 19 for 227 yards, two touchdowns and one pick. After two scrimmages, Rosier is 25 of 39 for 441 yards, five touchdowns and one interception. Shirreffs is 23 of 33 for 359, three touchdowns and one interception. With both Rosier and Shirreffs having successful days on Saturday, Richt was pleased with the results given Friday’s poor practice. Richt called the performance “precise,” praising Rosier and Shirreffs for their “sharp” play. Senior wideout Braxton Berrios had another strong showing, finishing with six catches for 107 yards. Sophomore running back Travis Homer finished with six carries for 48 yards and a touchdown. While Richt was pleased with how the offense did overall, the Hurricanes struggled in third-down situations. “The No. 1 defense probably won every single rep…and forced a field goal in an overtime situation,” Richt said about the offense’s execution on third down. Richt also said he hasn’t installed the goal-line offense yet, but expressed concern nonetheless. To complicate Miami’s goal-line woes, standout wide receiver Ahmmon Richards – who had been seen on the stationary bike at practice the last few days—was held out of the scrimmage with a pulled hamstring. The Hurricanes were also very hesitant with lead tailback Mark Walton, who only had three carries for zero yards as he is recovering from a minor hip injury. While Richt mainly focused on the offensive side of the ball, he was very impressed with two of his younger defensive playmakers. Freshman defensive back Amari Carter had eight tackles, including one for a loss, while sophomore defensive lineman Joe Jackson tallied six tackles, five of which were sacks. However, the quarterbacks were not live. As opening kickoff gets closer and closer, Richt and his staff look to hammer things home to be ready for the Wildcats come Sept. 2.